UK – Audio specialist Sennheiser has partnered with Pink Floyd to demonstrate its AMBEO 3D audio technology in action as part of the sound expert’s work for The Pink Floyd Exhibition: Their Mortal Remains, which opens to the public at London’s Victoria and Albert Museum on 13th May. One of the most anticipated elements of the exhibition is a new immersive mix of Comfortably Numb from the Live 8 concert – the last time David Gilmour, Nick Mason and Richard Wright played on stage with former member Roger Waters – created using Sennheiser’s AMBEO 3D technology in a brand-new format using 25 speakers. AMBEO 3D places sound both around and above the listener, delivering an immersive audio sensation unlike anything visitors have experienced before. “Pink Floyd has worked with Sennheiser and Neumann microphones throughout their career. 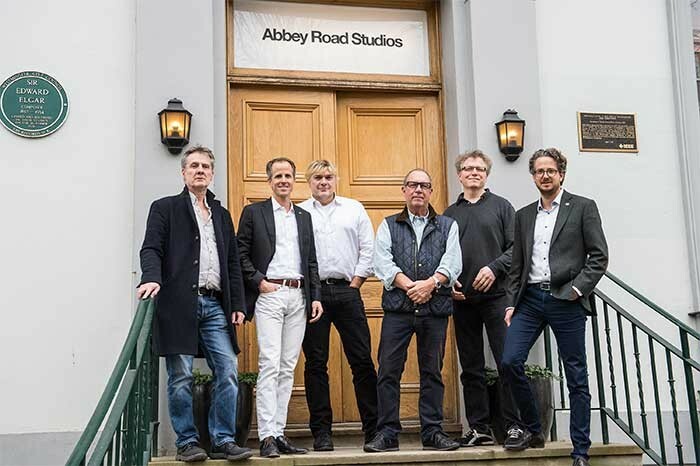 To come back to the Abbey Road studios to jointly work with the AMBEO 3D audio technology is a very special part within this collaboration,” said co-CEO Daniel Sennheiser. “3D audio is the new frontier of sound excellence, set to transform the listening experience for users. We are very happy to bring that special audio experience to The Pink Floyd Exhibition,” adds Dr Andreas Sennheiser. The Pink Floyd Exhibition: Their Mortal Remains will open to the public at London’s Victoria and Albert Museum on 13th May, 2017. In picture: Recording engineer Andy Jackson, Dr Andreas Sennheiser, producer Simon Franglen, co-curator Aubrey Powell, producer Simon Rhodes, Daniel Sennheiser.